Organization is the key to success! Creating and maintaining systems of organization will allow you to work more effectively, efficiently, and with less chaos. From your computer screen to your most important files, taking the time to organize will streamline your daily process and your office into a manageable system that seems to run itself. Read along for some best practices in establishing a sufficient, organized office. The golden rule of cleaning and organization is to declutter first, organize second. It’s important to get all of the “junk” off of workspace before you can begin to organize it. Take a day to go through every single paper, office supply, magazine, piece of mail, and so on, and put it into organized piles. From here, invest in organization tools that will keep your items in order. Think mail bins, desktop office supply organizers, shelving for more space, and so on. Your desk isn’t the only thing that can become highly disorganized! Your computer is equally as chaotic when it’s not in order. Start with your desktop – remove or digitally file away all of those past files, while creating new folders and files that make sense to you. Be sure that everything looks neat and orderly,and make sure it’s all easily accessible. We spend so much time viewing our computer during the day, and removing the clutter from your desktop and old files removes mental and visual clutter! Not only is your desktop important to organize, but so is your inbox. Make sure that emails and accounts are segmented by job position, employer, task, and so on. Create a system that makes important communications easy to find! Flagging messages is also a great way to stay organized and find things easily. Filing is incredibly important, especially for important items like tax information, business expenses, and so on. Keep things clear and simple by categorizing, creating a color code system, or using a label maker and folders to segment your items. Don’t just shove things in a file! Keep them organized and set up a filing appointment weekly. You can also look into digital filing systems for business cards and important documents, which is especially important for taxes and business structure. There’s a probably a lot of office space that you’re not utilizing! There’s wall space for extra shelving, under desk space which is great for filing boxes and cabinets, and desk drawer space for organized office supplies. Closets are good for old binders, extra printer paper, and so on. Put as many items out of view (in an organized way, of course!) as possible. Vow to keep your desk as a clutter-free zone that only includes the most necessary items. Don’t forget to go through and keep your desk drawer and/or organizers in order as well. Everything has a place and it’s your job to keep it that way. Set up a designated area for work, which would be your desk, a place for all of your filing and organizational items, like your filing cabinet, and a place for older items, such as a shelf in your closet. 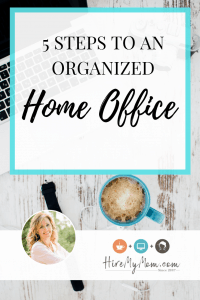 When you take the time to establish an organizational system that works for you, it’s so much easier to find important items and stay on track. It also clears the mental and physical clutter from your life, which is not only healthy, but much more efficient.